A Busy Weekend – Fours Heads, Tyne and Tees. 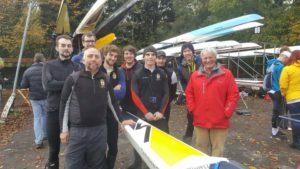 YCRC rowers were busy at both ends of the country last weekend as they took on national and regional competitions. 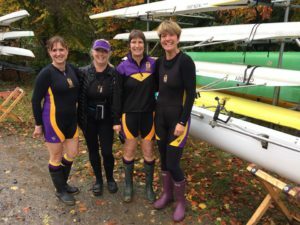 On Saturday, Vet’s Fours Head kicked off proceedings on the Tideway, with both men’s and women’s masters crews racing along the Boat Race Course in nearly the whole range of four-person boats! Our WB4+ came home a fantastic fourth in their category, our MasC4x- 9th, and the WMasD4x- of L&P rowers put in a not so leisurely time to come a fab 6th. Our WD4- were gloriously unopposed, but their time would have secured second place in the WC4- (without handicap). 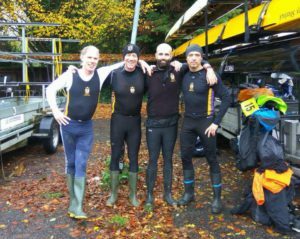 After that excitement, the stage was set for the Fuller’s Fours Head of the River on Sunday, and races for three men’s, one women’s and one junior crew. First home of the YCRC crews were the J184x- (18th in their category), followed by the Band 1 4x- (14th), the Band 2 4+ (6th), and the Band 2 4x- (19th). The Band 2 W4- came a fantastic 8th in their category, rounding off a weekend of solid performances on the Tideway. But the excitement was not confined to the Thames – the River Tees hosted both the Tees Long Distance Sculls and the Tyne Small Boats Head on Sunday. A phenomenal showing by our juniors, some of whom were racing long distance for the first time, landed wins in J15 2x, J14 4x+ and WJ15 2x in the LDS (morning), with a few rowers repeating their success in the afternoon in the J172x, WJ154x+ and J15 2x at the Tyne SBH. Thankyou to our fabulous trailer drivers, and all who raced on a fantastic weekend.